The National Park Service (NPS) will soon begin work to remove hazardous trees along Route 9 at the Vanderbilt Mansion National Historic Site in Hyde Park (Dutchess County). After a public comment period and agency reviews, the NPS made the decision to remove only trees that have been identified as high or severe risks to public safely. 100 trees will be removed out of the approximately 700 trees in this area. Once tree removal has been completed, 200 white pine trees will be planted in the understory, with the goal of re-establishing a visual barrier between the highway and estate grounds. During the project, the park will remain open to the public, but the work area will be closed for safety reasons. 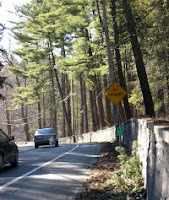 Some minor traffic delays may occur on Route 9 when trees leaning over the highway are removed. Teaching the Hudson Valley (THV) has announced the winners of its first student writing contest. Three winning writers and their classmates will visit the places they wrote about with costs covered by a THV Explore Award. environmentalists and writers of the world!” You can read Aayushi’s essay online. “Climbing up Bonticou Crag, I split open the wilderness,” is the provocative opening line of Looking Topside Down, a poem about the Mohonk Preserve by high school winner Nicole Yang. The middle school winner is seventh grader Emilie Hostetter who wrote a poem about Minnewaska State Park called I Did Not Know. Nicole and Emilie are students of Janine Guadagno at Tabernacle Christian Academy in Poughkeepsie. You can read both poems here. 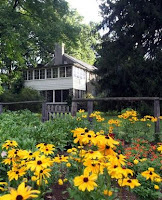 Roosevelt-Vanderbilt National Historic Sites will be offering historic landscape and garden tours, free, on the third Sunday of the month offered by the National Park Service and their partner, the Frederick W. Vanderbilt Garden Association. On July 17, August 21, September 18 and October 16, participants can meet at 1:00 pm at the Vanderbilt Mansion visitor parking area for the “200 Years of Landscape History” tour led by an NPS Ranger. The tour concludes at the Formal Gardens where visitors may join FWVGA volunteers between 1:00 pm and 3:30 pm for an additional 30-minute tour. Interpreter-guides will discuss the history of the gardens, Vanderbilt ownership and the on-going work by the Vanderbilt Garden Association which was formed in 1984 to rehabilitate and maintain the garden plantings. Park in the Vanderbilt Mansion visitor parking lot and follow the gravel path on the south side of the mansion. Tours will be cancelled if it rains. Please call 845-229-7770 or 845-229-6432 for status if the weather is questionable.